A large sculpture next to a mega monochrome painting – at first glance and from a distance, that’s what the serrated box and vertical garden of the new CaixaForum Madrid resemble. A Per Kirkeby next to an oversize Ad Reinhart or Brice Marden in an unknown green period, or perhaps a public piece by Claes Oldenburg and Coosje van Bruggen. The building by Swiss architects Herzog & de Meuron and the vertical garden by French botanist Patrick Blanc amount to a brilliant urban intervention that has transformed the site of a former power plant and petrol station in central Madrid into an important new addition to the city’s ‘art triangle’, an area formed by the Prado, Reina Sofía and Thyssen-Bornemisza Museums. Nonetheless, the resemblance of this intervention to sculpture and painting raises questions about contemporary architecture’s fascination with art. Even the ‘secular’ work of Herzog & de Meuron – indisputably the favorite architects of the art world – is clearly inspired by modern and contemporary art. Barcelona’s Forum 2004 Building, with its highly textured Yves Klein Blue-coloured skin, is a direct homage to the artist who invented that shade of blue. CaixaForum Madrid is the newest of a series of ambitious social and cultural outreach projects of the Fundación ‘la Caixa’, a private philanthropic foundation funded by one of Spain’s larger financial institutions. Like the CaixaForums in Barcelona and Palma de Mallorca, Madrid’s is a centre for exhibitions of ancient, modern and contemporary art (including works from the Fundación ‘la Caixa’ contemporary art collection), music and poetry festivals, debates, seminars on contemporary issues and educational workshops. And like most of the foundation’s building projects, which include CosmoCaixa science museums in Barcelona and Madrid as well as smaller cultural and social centres in Catalonia and the Balearic Isles, CaixaForum Madrid has a social agenda that includes the preservation of a significant piece of built heritage. CaixaForum Barcelona, by Arata Isozaki, involved the adaptive reuse of the Casaramona textile factory designed in 1909 by Josep Puig i Cadafalch. Similarly, CaixaForum Madrid recuperates the Central Eléctrica del Mediodía, a power plant designed in 1899 by architect Jesús Carrasco-Muñoz. It is well known that the art world generally prefers older buildings – especially those linked to a region’s industrial heritage – over completely new architecture for exhibiting visual art. The patina of worn and weathered buildings, according to many artists and curators, suits the display of contemporary art better than brand-new sterile spaces, though I suspect their preference may emerge in part from a predisposition for buildings that look like buildings and not like sculptures. The most monumental manifestation of this aesthetic preference is, of course, London’s Tate Modern, another power plant transformed by Herzog & de Meuron, although the prototype for exhibiting art in industrial buildings originates in the use made of New York warehouses by American minimalist and conceptualist artists of the 1960s and ’70s. In the case of CaixaForum Madrid, however, the appropriation of historical architecture is superficial: only the exterior walls of the Central del Mediodía have been preserved. Inside these walls – as well as above and below them – the construction is contrastingly new. Moreover, the historical building has been completely recontextualized: the heavy plinth that originally supported the power station has been removed and replaced by three points of support, causing the building to appear to levitate over the site. As a result, it is no longer self-evident that this was the original site of the Central del Mediodía. Industrial architecture is so rare and out of place in Madrid, the monumental capital of Spain, that one could easily imagine this building floating to the site all the way from Barcelona, Spain’s industrial capital and, incidentally, the headquarters of ‘la Caixa’. Indeed, with its addition on top, CaixaForum recalls the many 19th-century buildings of Barcelona’s Eixample district that were expanded vertically by as many as four storeys during the latter half of the Franco dictatorship, a period of rampant real-estate speculation. 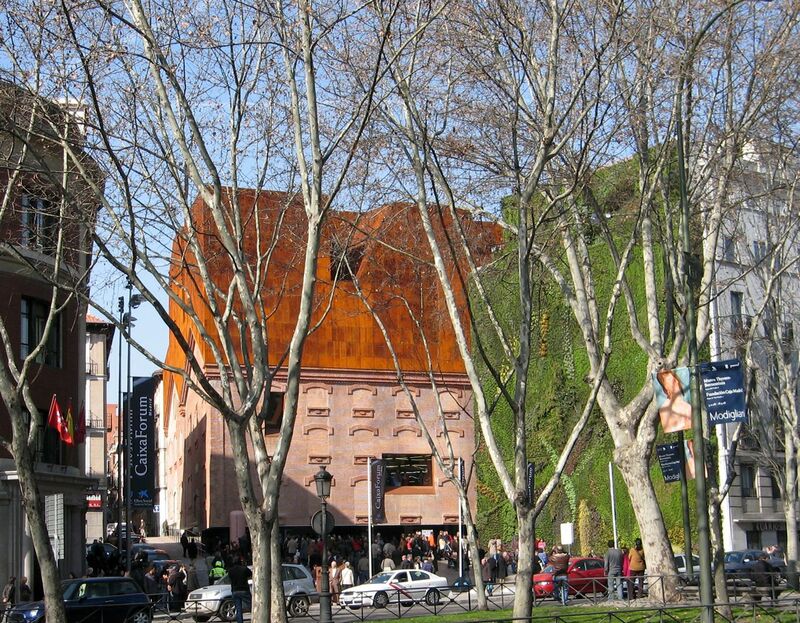 CaixaForum Madrid appears, then, to be a palimpsest, a collage, an exquisite corpse. But this is just an exterior reading: in addition to the elevated hybrid building, there is also a hidden underground component extending horizontally beneath the plaza. This underground component can be reached only after penetrating the elevated building through its topographical underside, by means of a sculptural winding stair that ascends from the plaza into the lobby. Here, a single picture window frames a view of Madrid’s Botanical Gardens across the busy Paseo del Prado and a segment of an adjacent block of buildings whose end wall supports Patrick Blanc’s vertical garden. To continue from the lobby to the rest of the building, the visitor must enter a stairwell that leads up to two exhibition galleries, a bar-restaurant and administrative offices; and down to an underground auditorium and lecture halls. The stairwell, a tapered vertical shaft, is important for structural reasons: it is the largest of the three vertical supports that elevate the building above the plaza. As the shear- and torsion-resistant structural core of the building, it functions like the vertical core of any high-rise building, except that it’s roomy and admits daylight from above. But the stairwell is no ‘museum atrium’ either: it is completely out of view with respect to the rest of the building, precisely because of the load-bearing and fire-resistant role of its heavy white concrete walls. In this regard, CaixaForum marks a significant departure from current art-museum thinking, in which galleries are typically organized around a central, brightly lit atrium to which visitors periodically return, as part of a strategy to alleviate disorientation and museum fatigue. The opacity of the structural stairwell separates each floor completely from the others; consequently, depending on the level at which one exits the stairwell, the décor could change completely. The lobby, with its bright silver beams, contrasts with the white terrazzo floored galleries, the natural wood and dark red-brown perforated metal of the underground spaces, and the delicately screened daylight passing through perforated Corten steel in the restaurant. Here, CaixaForum marks another significant departure from current museums: the building interior is neither monotonously monochrome nor ‘purist’ in an ‘honest’ display of construction materials. Like an urban palace– the first art gallery – CaixaForum contains a variety of differently finished rooms. Paint and interior wall coverings are no taboo for these Swiss architects. Although CaixaForum Madrid appears at first glance to resemble supersize art, up close it reveals itself to be surprising, eclectic and complex. It incorporates the façade of a historical building that has been emptied, but unlike the common heritage practice of ‘façadism’ –whereby a historical surface is used to camouflage modernity – the historical façade of this building functions as a character foil to some radical moves. CaixaForum Madrid appropriates many art-world architectural conventions but subtly turns them upside down. Precisely what the best art and architecture have always done. Criticalista collects Rafael Gomez-Moriana's writings on architecture, cities and the built environment. Some of these texts have previously been published elsewhere and are reprinted here with permission. All photographs by the author unless indicated otherwise. ©2014 Rafael Gomez-Moriana. This work is licensed under a Creative Commons Attribution 4.0 International License. Like what you're reading? If so, please make a donation. Writing thoughtful architectural criticism takes time and money. Thanks.